Games with enough hype behind them at can show up in several press conferences at E3, each appearance highlighting a new part of the game. 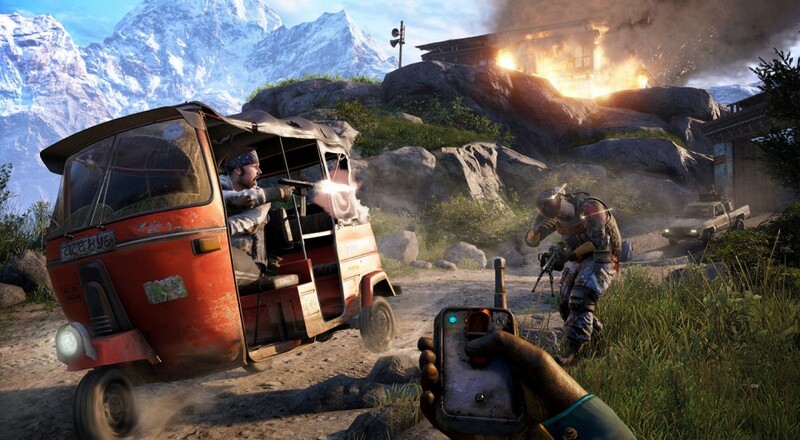 Far Cry 4 got a double-feature this year, showing up first in Ubisoft's conference before moonlighting at Sony's. The shooter, due out November 18th of this year, demonstrated some of its explosive, high-flying gameplay at the Sony show, where they were also kind enough to clue us in on some co-op options. How is that "liberated" exactly? You've still got some really, really mad elephants all up in this piece ready to obliterate anything that moves. The original presentation wasn't narrated, but we still got to see an elephant headbutt a hostile vehicle until it explodes. More importantly, we watched player-controlled Hurk deal death from above in his armed ultralight. Snag the Far Cry 4 "Kyrat Edition" for a Meager $129.99! Page created in 0.3195 seconds.